Premier Greens is nature’s amazing super nutrition formula for optimal health and rejuvenation. 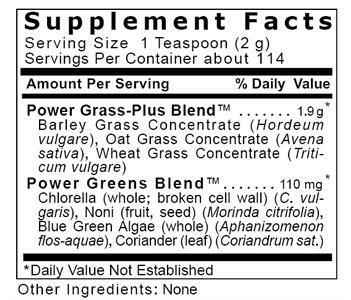 Our prized greens blend features our pristine Power Grass-Plus Blend™ (low-temperature, air-dried young grasses) coupled with Power Greens Blend™ for optimal effect. It contains no toxic sweeteners, additives or fillers. Take 1 teaspoon mixed into water or other liquids, 3 times daily. This product is nitrogen flushed for maximum freshness and vitality.